To begin, first set the bar on the height that best matches your height. 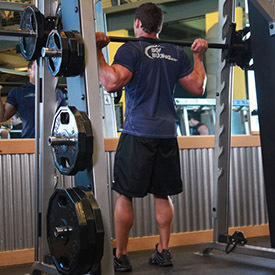 Once the correct height is chosen and the bar is loaded, step under the bar and place the back of your shoulders (slightly below the neck) across it. Hold on to the bar using both arms at each side (palms facing forward), unlock it and lift it off the rack by first pushing with your legs and at the same time straightening your torso. 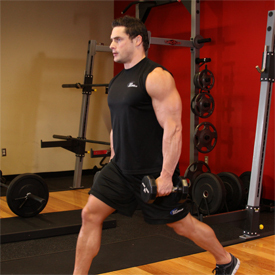 Position your legs using a shoulder width medium stance with the toes slightly pointed out. Keep your head up at all times and also maintain a straight back. This will be your starting position. (Note: For the purposes of this discussion we will use the medium stance which targets overall development; however you can choose any of the three stances discussed in the foot stances section). 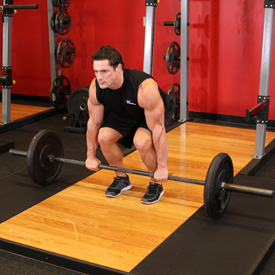 Begin to slowly lower the bar by bending the knees as you maintain a straight posture with the head up. Continue down until the angle between the upper leg and the calves becomes slightly less than 90-degrees (which is the point in which the upper legs are below parallel to the floor). Inhale as you perform this portion of the movement. 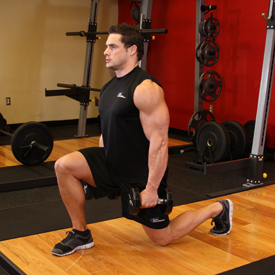 Tip: If you performed the exercise correctly, the front of the knees should make an imaginary straight line with the toes that is perpendicular to the front. If your knees are past that imaginary line (if they are past your toes) then you are placing undue stress on the knee and the exercise has been performed incorrectly. Caution: This is not an exercise to be taken lightly. 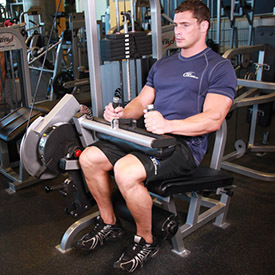 If you have back issues, substitute it with leg presses instead. If you have a healthy back, ensure perfect form and never slouch the back forward as this can cause back injury. Be cautious as well with the weight used; in case of doubt, use less weight rather than more. 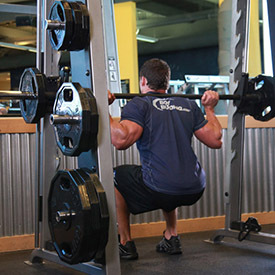 The squat is a very safe exercise but only if performed properly. Step forward with your right leg around 2 feet or so from the foot being left stationary behind and lower your upper body down, while keeping the torso upright and maintaining balance. Inhale as you go down. Note: As in the other exercises, do not allow your knee to go forward beyond your toes as you come down, as this will put undue stress on the knee joint. Make sure that you keep your front shin perpendicular to the ground. 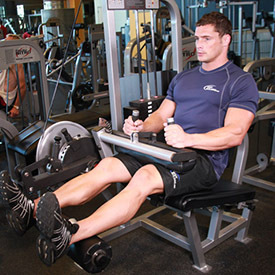 As you exhale, pull the machine lever as far as possible to the back of your thighs by flexing at the knees. Keep your torso stationary at all times. Hold the contracted position for a second. 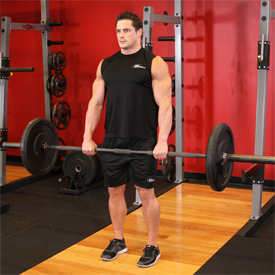 Stand in front of a loaded barbell. While keeping the back as straight as possible, bend your knees, bend forward and grasp the bar using a medium (shoulder width) overhand grip. This will be the starting position of the exercise. Tip: If it is difficult to hold on to the bar with this grip, alternate your grip or use wrist straps. While holding the bar, start the lift by pushing with your legs while simultaneously getting your torso to the upright position as you breathe out. In the upright position, stick your chest out and contract the back by bringing the shoulder blades back. Think of how the soldiers in the military look when they are in standing in attention. Go back to the starting position by bending at the knees while simultaneously leaning the torso forward at the waist while keeping the back straight. When the weights on the bar touch the floor you are back at the starting position and ready to perform another repetition. 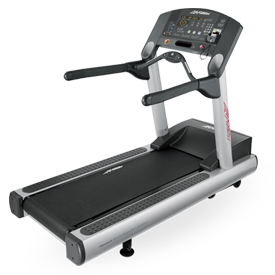 Perform the amount of repetitions prescribed in the program. This is not an exercise to be taken lightly. If you have back issues, substitute it for a rowing motion instead. If you have a healthy back, ensure perfect form and never round the back as this can cause back injury. Be cautious as well with the weight used; in case of doubt, use less weight rather than more. Variations: Dumbbells can be used as well though I find the bar version easier to perform.